Fast, easy, and accurate authenticity verifications! Trade in merchandise that infringes on intellectual property rights has become a serious concern, with the globalization of product sales activities and diversification of Internet-based sales and other sales channels. Concerns include injuries and damages from counterfeit goods and the inclusion of imitation goods in bulk containers.Our solution enables consumers, as well as distributors and other stakeholders, to verify the authenticity of merchandise. This solution can provide your customers with reassurance and security as well as help to boost your company’s anti-counterfeiting efforts and brand image. 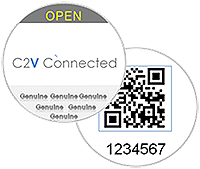 With our solution, potential customers use their smartphone to scan a ConnectedTag (an ID tag to certify that a product is genuine) affixed to or packaged with the product. The tag data are transmitted to a cloud server where the product’s authenticity is verified and the results are sent back and displayed on the smartphone’s screen. Several ConnectedTag verification methods are available, including NFC (RFID) tags, QR codes, or security codes. Easy & accurate way for consumers to verify authenticity of a product Digital data matching is used to verify the authenticity of the product. Consumers can obtain accurate verification results without any special knowledge or experience, or any dependence on visual confirmations or other specific skills. All the consumer needs to verify the authenticity of a product is a smartphone (no special devices or special filters are needed). This eliminates costs for companies introducing the solution while making the service accessible to ordinary consumers. 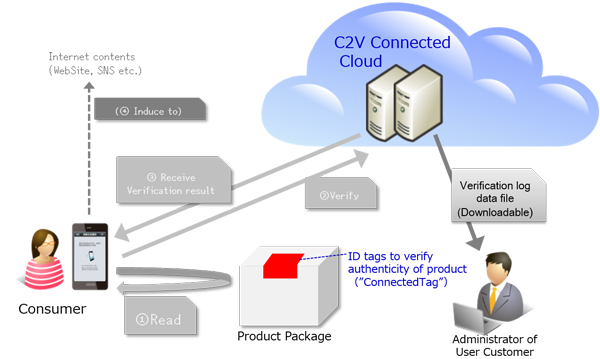 Customizable verification ID tags (ConnectedTags)ConnectedTag is an umbrella term for our tag products containing ID data that can be authenticated online. Examples include NFC (RFID) tags, variable QR codes, and security codes. Many variations are available, such as seals or cards, and the size and design of the tags can be tailored to suit any application. ConnectedTags work with consumer electronics, medical supplies, luxury goods, food and beverage products, and many other types of products. Product authenticity verification logs (date and time, verification results, location information, tag ID data, running total of verifications, specific device information, etc.) can be analyzed and the analysis results can be used to drive users from the verification service app to your website or product pages on social media. Our solution can be utilized as a part of dynamic IT strategies to bolster your marketing strength. Providing our technology for verifying genuine Canon products in the China market as a cloud service Canon China has relied on the core technology of C2V Connected to verify genuine Canon-manufactured cameras since 2013. (See the solution case studies for details.) By using this technology as a cloud service, it will be possible to quickly and inexpensively roll out next-generation online product authenticity verifications. We provide a smartphone app that lets consumers easily and accurately verify the authenticity of a product with the ID data contained in a ConnectedTag (web-browser based verification is also available). You can customize the app’s screen (custom skins) to feature product images or your corporate logo. Note: Screenshot images show a conceptual Android app. The smartphone app menus can also be customized. Use custom menus for marketing purposes, such as enticing users to your website, a special campaign site, or a product information site. 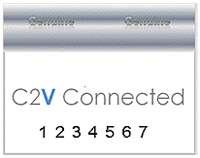 The C2V Connected cloud server keeps a log of the date and time when verifications are made, the verification results, user location information, tag ID data, the running total of verifications, and other statistics. Administrators at companies using the solution can view logs and download log data. Analyze log data to determine product usage by consumer region or to find trends in detections of non-genuine products. The manufacturer or sales company attaches ID tags (ConnectedTags) to products prior to shipping. Consumers scan the ConnectedTag with a smartphone browser or app and verify whether the product is genuine. When the product is verified as genuine, the manufacturer or sales company can direct the consumer to its Internet content (websites, etc.). Administrators at the manufacturer or sales company can view verification logs via a web browser and download log data. Canon China uses an online verification solution to verify the authenticity of Canon digital SLR cameras. Canon China seals product packages with a seal containing a verification ID tag. The seal also signals that the package has not been opened or tampered with. This lets consumers verify the product’s authenticity before purchasing. A PUF-based RFID tag is used because it is practically impossible to duplicate. The circulation of counterfeit products may cause unexpected consequences for consumers and may even endanger their health. The circulation of counterfeits tarnishes the brand’s market value and prestige. Using counterfeit batteries or other non-genuine replacement parts may damage the original product or cause malfunctions. Crude knock-offs of golf clubs, tennis rackets, and other sporting goods may cause injuries or accidents. Verification tags that can be scanned with smartphones with an NFC reader. We also provide high-security PUF-based RFID tags that are practically impossible to duplicate or fake. QR code based verification tags that can be scanned with camera-equipped smartphones. Cheaper to implement than NFC tags. The following are samples of standard seal-type tags. We also provide card-type NFC tags and tags with designs, materials, and sizes tailored for specific product packages. This is a NFC (RFID) seal-type tag with a vulnerability specification that can also be used to signal that the package has not been opened or tampered with. We also offer highly tamper-resistant PUF-based RFID tags that are practically impossible to duplicate. A two-layer seal, in which the cover seal is removed to reveal the QR code underneath. This is a small seal-type tag. 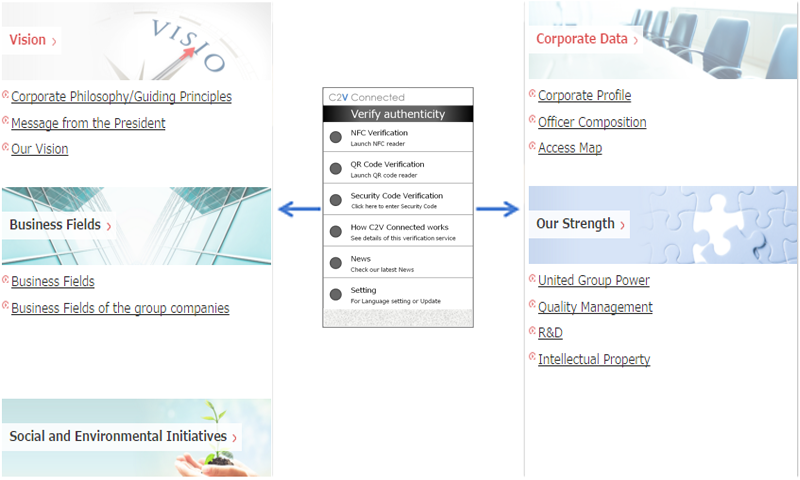 Users verify the product’s authenticity by entering the Security code into the smartphone app. Microstructures — so-called IC chip fingerprints — unique to each IC chip are formed in the chip-fabrication process. By digitizing and identifying these microstructures, they can function as PUF parameters. PUF parameters are distinguished by having unpredictable but permanent output patterns. Therefore, even if the LSI circuit pattern were copied, it would still be possible to differentiate between the original and the copy, which makes PUF technology very useful for stopping counterfeits. NFC is an ISO-standardized short-range wireless communication technology. More and more smartphones today use NFC to implement contactless IC card functions or reader / writer functions. 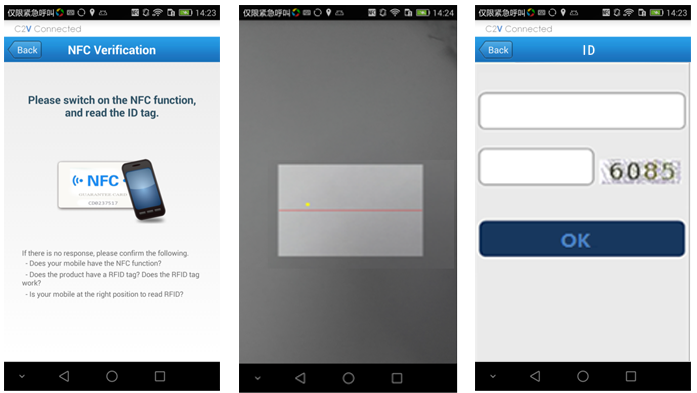 NFC supports the Type A, Type B, FeliCa, and ISO 15693 communication protocols. The WCO is an international organization headquartered in Brussels, Belgium. It was established in 1952 with the aims of facilitating international trade and harmonizing and unifying customs procedures between countries. In cooperation with its member states, the organization advances international technical collaborations in such areas as conventions on customs, creation of international trade guidelines, and controlling cross-border trafficking of illegal drugs and products infringing on intellectual property rights. Funded by contributions from its member states, the WCO had 180 national and regional members as of December 2015. Japan joined the WCO in 1964.